While it is your responsibility to wake up and feed your newborn, it is likewise your responsibility to teach them to sleep. Begin by creating a loud, bright stimulating daytime where people talk at full voice, listen to music and watch T.V. In contrast nighttime should be dark and boring, where one parent wakes and calmly feeds the newborn in dim lighting. In the first two weeks of life, parents should feed their newborn every 2 to 3 hours (even at night). 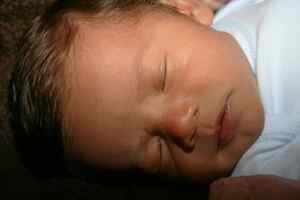 After a child has gained back their birthweight let your child wake you at night. See all sleep for children.